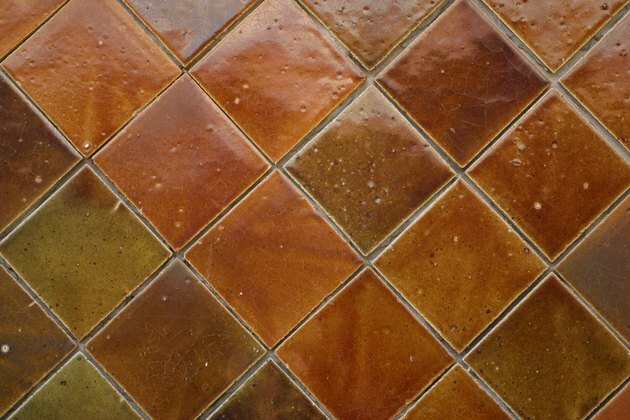 Glaze or gloss, a protective and decorative finish, is baked onto ceramic and terracotta tiles at very high temperatures, until it forms an upper layer. However, you may need to rough up or remove the glaze if you want to repaint the tiles, or if you prefer the natural look of tile in areas where moisture resistance is not a problem. Paint applies better to a rough, porous surface than one that is smooth and glossy. With proper tools, you can easily remove the glossy finish from flooring tiles. De-glaze a tiled floor prior to painting it. Clean the tile surface with a degreaser cleanser specifically formulated to strip off wax or grease from the tile surface. 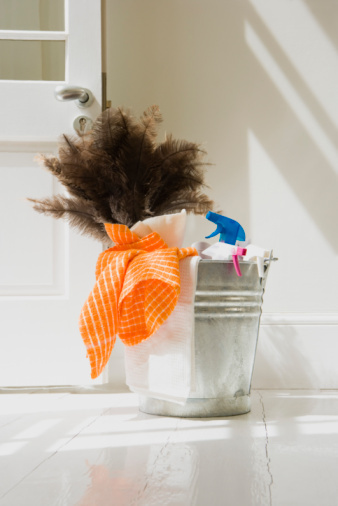 Wash the floor with a rag to remove accumulated dirt and debris, so the surface is as clean as possible. Thoroughly dry the tiled surface with a towel. Insert a piece of 220-grit grit sandpaper on an orbital sander. Wear a dust mask to prevent inhaling the sanding residue. Hold the sander flat against a corner of the tiled surface. Begin sanding a corner of the tile, moving the sander in small, circular motions over the surface. Do not push the sander over the tile, but maintain steady pressure so you remove the glaze without causing scratches. Continue to sand four to five tiles, moving from one corner to the other corner of each. Soak a sponge in a bucket of warm water and take it out. Squeeze out extra water from it before rubbing it over the sanded tiles to remove sanding debris. Alternatively, vacuum the tiles clean using a shop-vac. Check the sandpaper and replace it if it appears worn before you resume the sanding process. Repeat the sanding and vacuuming process until you rough up the floor tiles. Ensure the tiled surface is thoroughly clean and free from sanding residue before progressing. Wear rubber gloves to prevent direct contact with the cleaning agent. Dip a clean sponge in a bucket of trisodium phosphate cleaning solution. Wipe the de-glazed tiles with the solution to remove sanding, oil or dirt residue.